The number of road accidents where people suffered injuries in Wales dropped by 11% last year, figures show. There were 4,921 such crashes in 2016 - 622 fewer than 2015, according to the Welsh Government's annual report. 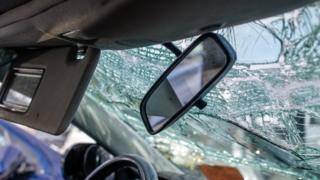 The overall number of accidents which resulted in death or serious injury in Wales in 2016 - 975 - was 21% lower than the average in 2004-08, with authorities seeking to bring that down a further 19 percentage points by 2020. However, there has only been a 1% drop in the number of motorcyclists killed or seriously injured in crashes in Wales, with a 25% drop targeted by 2020. That is despite the latest figures showing the number of motorcycle-crash casualties hitting a four-year low in 2016 - 662 - after a previous peak in 2014. In total, 103 people were killed in accidents on Welsh roads - two fewer than in 2015. Road safety charity, Brake, said it was "good news" fewer people were being injured or killed on Welsh roads. "However, more needs to be done to bring this figure down further," a spokesman added. GoSafe Wales, a partnership made up of the Welsh local councils, police forces and the Welsh Government, is charged with making people safer on the roads. Teresa Healy, of GoSafe, said: "We continue to work with our partners in Wales to contribute to the reduction of collisions on our roads. "This includes being members of the Young Persons and Motorcycling steering Groups, which are focused on targeted interventions for these high-risk groups. "Whilst the reduction in collisions seen to date is positive, we are actively working to contribute to achieving the targets set out by the Welsh Government Road Safety Framework for Wales (July 2013). "We contribute through the enforcement of speeding, use of mobile phones and not wearing of seatbelt, as well as running Operation Snap, which enforces other traffic offences detected by dashcams or similar devices."